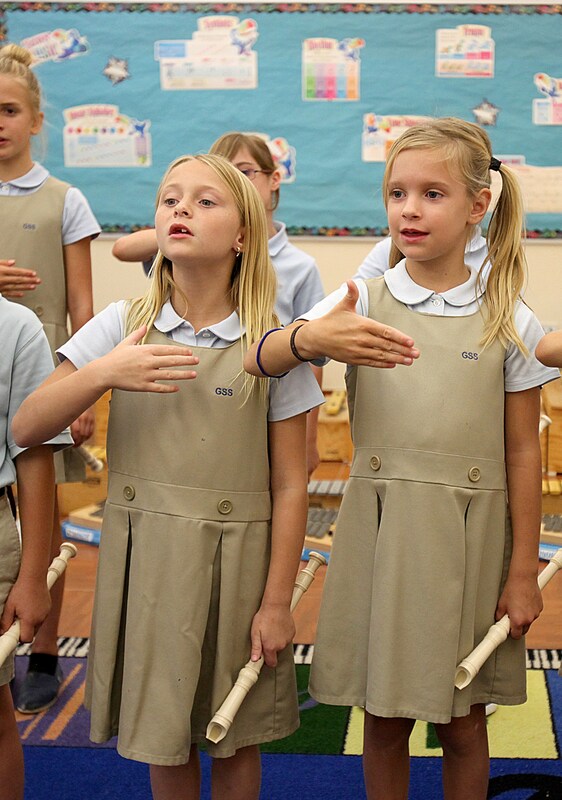 Lower School music classes meet twice a week. The music program in Lower School is dedicated to the goal of making music a significant source of enjoyment and fulfillment to each student, both now and throughout his or her life. This objective of teaching students to value music is approached on three levels: perceiving music, producing music, and responding to music. To perceive music aesthetically, students must hear and learn to detect the qualities that make sound expressive. Beginning in the lower grades and increasing in complexity as the students themselves grow, a varied program of music appreciation is presented. The single most important aspect of the curriculum is the production of music. Students learn to read and write musical notation, beginning with rhythm and progressing to the pitches of the treble and bass clefs. As the students learn the inner working of music, they also produce it through singing, playing (rhythm and Orff instruments), moving, and performing. Third Graders engage in a year-long study of the recorder while Fourth Graders learn to ring the English handbells. In developing an educated musical response, students are encouraged to respond intellectually as well as emotionally to the work under consideration. Lower School art classes also meet twice a week. The elementary art program, which is grade-specific in terms of content, continues to be multimedia with a focus on elements and principles of design, art history, modern artists, and the study of Florida and its multicultural flavor. We follow the social studies and geography curricula to introduce cultural art forms and art history. The Art Department participates in many community activities. The students participate in area exhibits and design invitations and program covers for school events. They also help with scenery for theatrical productions. The program is enriched by visiting artists and museum trips. Lower School students have drama once each week. In addition to which they have many opportunities throughout their Lower School years to perform or speak in front of an audience. The drama program presents the fundamentals of acting to beginning students. Basic skills are taught and practiced through games, exercises, and improvisations in order to learn clarity of speech, projection of voice, concentration, the expansion of physical, vocal, and emotional expression, and the growth of imagination and creativity. Each class learns the process involved in staging a production as they put together at least one performance each year to be performed in Chapel.